History: "I...I thought you were dead!" These were the first words out of "Hollywood" Hulk Hogan's mouth when the Warrior reappeared in the wrestling world in late '98. The Warrior's return to the ring briefly reminded many fans of wrestling history, even if it did not have the long-term impact many had expected. Jim Hellwig began his "wrestling" career as a bodybuilder, alongside Sting and other wrestlers in Powerteam USA. Hellwig then began tagging with Sting in various promotions, first as the Freedom Fighters, then becoming the Blade Runners, Rock (Hellwig) and Flash (Sting). The two wrestled well together in the Mid-South, yet never managed to earn the Mid-South Tag-Team Titles. In 1986, "Rock" headed to the World Class Wrestling Association. As the Dingo Warrior, Hellwig became a fan-favorite, feuding with such wrestlers as Matt Borne, Buzz Sawyer, and others. In November '86, Dingo and Lance von Erich defeated Borne and Master Gee to win the WCWA Tag-Team Titles. They held the titles for less than a month before losing to Brian Adias and Al Madril. This did not deter the Warrior. A few months later, Dingo managed to beat Bob Bradley to win the WCWA Texas Heavyweight Title, which he held against all comers for over 4 months. After losing the title to Al Perez, the Dingo Warrior decided to leave the WCWA. In late 1987, the Ultimate Warrior made his debut in the WWF. At first, he mainly wrestled against mid-carders, rarely engaging in the major matches. His wrestling physique and maneuvers were noticed, however, and he was given a shot at the WWF Intercontinental Title in August '88. The Warrior quickly disposed of the Honky Tonk Man to earn his first gold in the WWF. He then began a major feud with "Ravishing" Rick Rude. It started at the Royal Rumble in '89, when the two wrestlers engaged in a "Posedown". The Warrior was obviously winning, so Rude and Bobby "The Brain" Heenan brutally attacked Hellwig. This led to many matches between the two. The Warrior lost the I-C belt to Rude, then came back a few months later to reclaim it, nearly to the day he had first won it the year before. By now, the Ultimate Warrior was one of the most popular wrestlers in the WWF. Only one was thought to match his stardom at the time: Hulk Hogan. The two met at Wrestlemania VI, two champions facing off in one of the great matches in WWF history. After a brutal battle which featured both wrestlers' finishing moves, the Warrior managed to defeat Hogan for the WWF World Title. It was the Ultimate Warrior's finest hour. 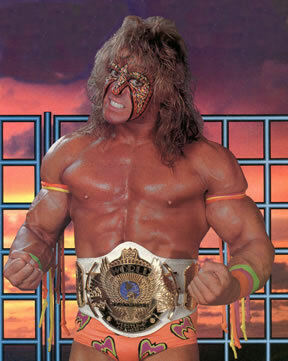 After vacating the I-C belt, the Warrior defended the WWF World Title for more than 9 months, feuding with Mr. Perfect (Curt Hennig), Haku (Meng), and others. But it was the feud with the "Macho King" Randy Savage that eventually cost him the World Title, as Savage hit the Warrior with his sceptor during his match against Sergeant Slaughter, who pinned him for the belt. The war between Savage and the Warrior truly began then, as the two wrestlers attacked each other repeatedly over the next month, and faced off in a "retirement" match at Wrestlemania VII, in which Savage landed numerous Flying Elbows, yet could not put the Warrior away. Savage was finally defeated by the Warrior, in another of the great matches in WWF history. The Ultimate Warrior then went on to feud with Jake "The Snake" Roberts and the Undertaker, then briefly left the WWF in 1991. He reappeared to help out Hulk Hogan at Wrestlemania VIII, when he was attacked by Papa Shango and Sid Justice. After a short feud with Shango, the Warrior briefly aided (and fought with) "Macho Man" Randy Savage. The two were teamed for a few matches as the Ultimate Maniacs. Then the Warrior again left the WWF, to open the "Warrior University", a wrestling school in Arizona. He had a few tours with small-time wrestling organizations, but mainly stayed away from the big-time circuits for a few years. At Wrestlemania XII, the Ultimate Warrior returned to the WWF, easily defeating Hunter Hearst Helmsley. Although he had a few memorable feuds against Goldust and Owen Hart, the Warrior did not win any titles and soon was back out of the WWF. He again stayed away from the sport for a few more years, prefering to help others instead. In September '98, the Warrior appeared at a Monday Nitro amid smoke and fire, declaring war against "Hollywood" Hogan and the nWo Hollywood faction. He announced the forming of the One Warrior Nation and began mind games on Hogan. He "kidnapped" the Disciple, one of Hogan's most loyal followers, and turned him against Hogan. Hogan and the Warrior met at Halloween Havoc '98, where Hogan won by having his nephew, Horace Hogan, interfere. Soon after, Hogan "retired", leaving the Warrior without his reason for returning to the ring. A few weeks later, both the Disciple and the Warrior were released by WCW, the angle having fizzled out between himself and Hogan. The Warrior would leave the squared circle, never to return, instead finding new ways to get his message heard to the people. The Warrior's views can now be found on his official website (listed above), with all the information you could ask about the former wrestling legend. - NWA Mid-South UWF Title Tournament (May '86) = Blade Runner Rock lost to Ted DiBiase. Terry Gordy won the tournament. - WCCW Wrestling Star Wars (February 2, '87) = The Dingo Warrior won the WCCW Texas Heavyweight Title, beating Bob Bradley. - WWF Royal Rumble '88 = The Ultimate Warrior competed in the Rumble, which was won by Jim Duggan. - WWF Wrestlemania IV ('88) = The Ultimate Warrior pinned Hercules. - WWF Summerslam '88 = The Ultimate Warrior won the Intercontinental Championship from the Honky Tonk Man. - WWF Saturday Night's Main Event #18 (November 16, '88) = The Ultimate Warrior retained the IC Title, beating Super Ninja. - WWF Survivor Series '88 = The Ultimate Warrior, Brutus Beefcake, Jim Brunzell, Sam Houston & the Blue Blazer fought in an "Elimination" Match against Ron Bass, Greg Valentine, Danny Davis, Bad News Brown & the Honky Tonk Man. The Ultimate Warrior was the sole 'survivor'. - WWF Saturday Night's Main Event #19 (December 7, '88) = The Ultimate Warrior stayed the Intercontinental Champion, taking down the Honky Tonk Man. - WWF Royal Rumble '89 = The Ultimate Warrior won a "Posedown" over "Ravishing" Rick Rude. - WWF Wrestlemania V ('89) = The Ultimate Warrior lost the Intercontinental Title to "Ravishing" Rick Rude. - WWF Summerslam '89 = The Ultimate Warrior defeated "Ravishing" Rick Rude to regain the Intercontinental Championship. - WWF Saturday Night's Main Event #24 (October 31, '89) = The Ultimate Warrior won, via DQ, over Andre the Giant. He stayed the IC Champ. - WWF Survivor Series '89 = The Ultimate Warrior, Jim Neidhart & the Rockers fought in an "Elimination" Match against Arn Anderson, Bobby Heenan & the Colossal Connection. The Ultimate Warrior was the sole 'survivor'. - WWF Saturday Night's Main Event #25 (January 3, '90) = The Ultimate Warrior & Hulk Hogan won over Mr. Perfect & the Genius. - WWF Royal Rumble '90 = The Ultimate Warrior competed in the Rumble, which was won by Hulk Hogan. - WWF Main Event III (February 23, '90) = The Ultimate Warrior pinned Dino Bravo, staying the IC Champion. - WWF Wrestlemania VI ('90) = The Ultimate Warrior, as the Intercontinental Champion, defeated Hulk Hogan to win the WWF Heavyweight Title. - AJPW US/Japan Wrestling Summit (April '90) = The Ultimate Warrior retained the WWF World Title, defeating Ted DiBiase. - WWF Saturday Night's Main Event #26 (April 23, '90) = The Ultimate Warrior defended the Heavyweight strap by beating Haku. - WWF Saturday Night's Main Event #27 (July 16, '90) = The Ultimate Warrior won, via DQ, over "Ravishing" Rick Rude, keeping the World Title. - WWF Summerslam '90 = The Ultimate Warrior kept the Heavyweight Title, winning a "Steel Cage" Match over "Ravishing" Rick Rude. - WWF Saturday Night's Main Event #28 (September 18, '90) = The Ultimate Warrior & the Legion of Doom took down Demolition (Axe/Smash/Crush). - WWF Main Event IV (October 30, '90) = The Ultimate Warrior kept the World Title by winning, via DQ, over Ted DiBiase. - WWF Survivor Series '90 = The Ultimate Warrior, Kerry von Erich & the Legion of Doom fought in an "Elimination" Match against Mr. Perfect & Demolition. The Ultimate Warrior was the sole 'survivor'. Later in the night, the Ultimate Warrior joined Hulk Hogan & Tito Santana in the "Survivors Elimination" Match against Ted DiBiase, Rick Martel, the Warlord & Power & Glory. The Ultimate Warrior & Hogan were the 'survivors'. - WWF Royal Rumble '91 = The Ultimate Warrior lost the Heavyweight Title to Sgt. Slaughter. - SWS Wrestlefest (March '91) = The Ultimate Warrior defeated Sergeant Slaughter. - WWF Wrestlemania VII ('91) = The Ultimate Warrior won a "Retirement" Match over "The Macho King" Randy Savage. - WWF Saturday Night's Main Event #29 (April 15, '91) = The Ultimate Warrior won, via DQ, over Sgt. Slaughter. - WWF Summerslam '91 = The Ultimate Warrior & Hulk Hogan won a "Handicap" Match over Sgt. Slaughter, General Adnan & Col. Mustafa. Sid Justice was the special referee. - WWF Summerslam '92 = The Ultimate Warrior won, via Countout, over the World Champion, "Macho Man" Randy Savage. - WWF Saturday Night's Main Event #31 (October 27, '92) = The Ultimate Warrior & "Macho Man" Randy Savage won, via Countout, over the WWF Tag Champs, Money Inc.
- WWF Wrestlemania XII ('96) = The Ultimate Warrior defeated Hunter Hearst Helmsley. - WWF Good Friends, Better Enemies (April '96) = The Ultimate Warrior won, via Countout, over the Intercontinental Champion, Goldust. 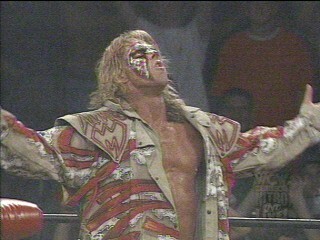 - WWF Beware of Dog (May '96) = In a dark match, the Ultimate Warrior won over Owen Hart. - WWF King of the Ring '96 = The Ultimate Warrior beat Jerry Lawler. - WCW Halloween Havoc '98 = The Warrior, due to interference from Horace, was beaten by "Hollywood" Hogan.